Dr. Nahida Abdulla Abdulkadir Nasseri, founder of ‘The Emirates Walk For Autism’ and Al Sharq Hospital, are gearing up to raise awareness for autism this Friday in Fujairah. The walk will start from the entrance of the Al Sharq Hospital at 5pm and participants will start registrations at 4pm onwards with refreshments and activities. Autism Awareness campaigns are held globally during the month of April and the initiatives in the UAE are supported by Emirates Red Crescent to help fund research and more importantly to educate the public about Autism. Al Sharq Hospital has stepped forward to include Autism awareness into their CSR programme and being part of the walk is a strategy to motivate more parents to come forward if they notice anything different in children as early intervention is key for an affected child’s progress. Dr. Nahida started this initiative to encourage people to be supportive of the challenges parents of autistic children face and be understanding of the behavior of affected children when their routine or environment is changed. 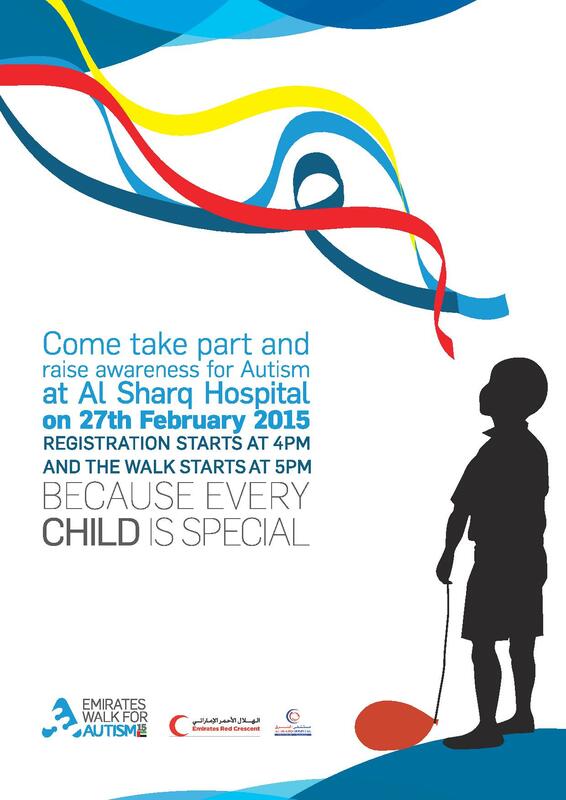 Interested participants can join the walk on Friday 27th February from 4pm at Al Sharq Hospital, Fujairah.